I am a finisher. Few things give me greater satisfaction than crossing something off the list. Work hasn’t given me much of that satisfaction lately, so I needed a little pick-me-up. 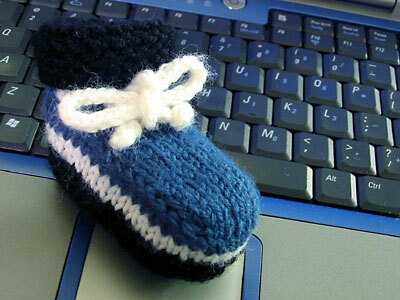 I guess this doesn’t really qualify as finishing something, unless someone has a one-footed baby who needs a bootie. Nor was the gratification all that instant. I think I put around 10 hours into it and ripped and re-knit virtually every part of the bootie at least once, some parts as many as five times, just so I could tweak small details. But it was still immensely satisfying to produce a physical object that perfectly realizes the bootie design I had rattling around in my head. Knittin’, and Sewin’, and Thinkin’: Crochetin’? CogKnition posted this on August 17th, 2007 @ 7:04pm in Unfinished Objects | Permalink to "A Bit of Instant Gratification"
What a cute bootie! Please put the pattern up! That’s super cute! I’m in the process of making some gifts for my cousin’s baby shower, and I think the booties would make an excellent addition.